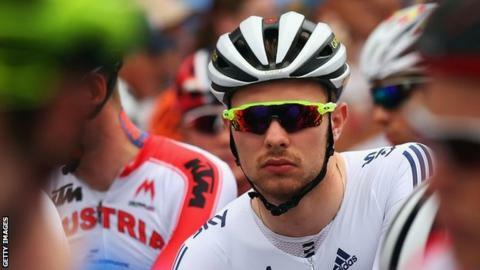 Welsh cyclist Owain Doull says the World Road course in Richmond, Virginia is "not as hard" as some would expect. Doull hoped to win the Under-23 race for Great Britain, but finished 92nd after two crashes and two mechanical failures in wet conditions. The senior women's race takes place on Saturday and the men's on Sunday. "It's a hard race, but not as hard as people are expecting," said Doull, whose hopes ended on the final lap. His progress was halted on Libby Hill as riders fell. "It started raining a little bit heavy on the last lap and people were just going down left, right and centre all over the place on those cobbles," said Doull. He seemed to be in a prime position to challenge for a medal, but finished four minutes behind winner France's Kevin Ledanois. "I was feeling really good all day. It's just one of those things, I think - it was pretty treacherous and it wasn't the best day," added Doull. "Two crashes and two mechanicals, both on the climbs, so no luck." He added: "It's kind of funny. I said to the lads before 'I'll either win or crash out'. "And it was crashing out... but I don't think we did anything wrong as a team and we all rode as hard as we could."